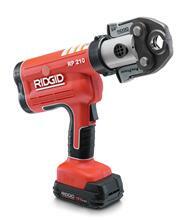 The new RIDGID RP 210-B Press Tool is now available. The compact-designed RP 210-B is two inches shorter and 25 percent lighter than our previous compact press tool, making it the smallest and lightest press tool in the RIDGID product line. Additionally, the RP 210-B has the capability to make presses up to 1-1/4". Featuring an ergonomic design, the user-friendly RIDGID Model RP 210-B press tool weighs 5.6 pounds. It has 270-degree barrel rotation and a flattened top, providing greater accessibility for users making connections in confined spaces. The RP 210-B also has indicator lights that provide feedback and safety information with an intuitive interface. The RP 210-B expands the capabilities of previous compact tools to now press 1-1/4" connections in addition to 1/2", 3/4" and 1". The tool features an improved rotating barrel that is fully compatible with existing 100-B jaws. An optimized gear ratio also contributes to better performance at cold temperatures and more presses per charge. Batteries for the tool are available in three different amp hour ratings so that a user can have a choice of run times. An additional benefit is an increased service interval from 20,000 presses to 30,000 presses, which means more up-time on the job site.